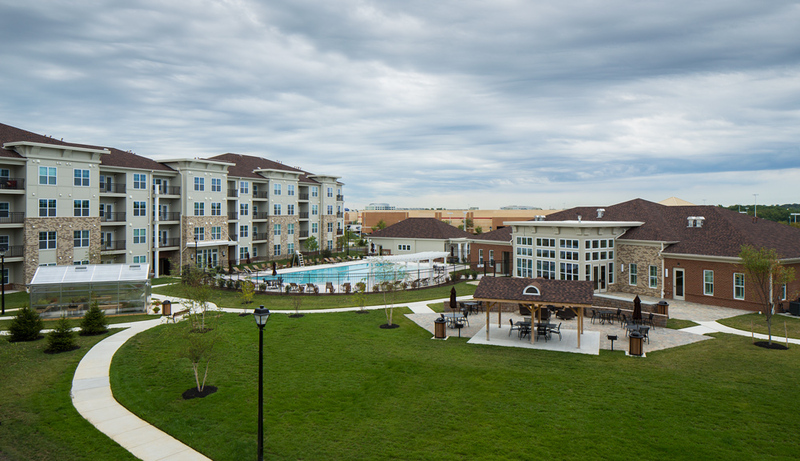 Situated just outside of Baltimore and only a short drive from Washington, D.C., Paragon at Columbia Overlook apartments neighboring Columbia, MD, offers the best in suburban tranquility, thoughtful design and unparalleled access to the area. At first glance you will notice the refreshing look and feel of this one and two bedroom community, but dig deeper and you will also find an NGBS Green Certified community with eco-friendly amenities and energy-conscious apartment appliances. Come inside and experience serenity for yourself. As you tour your next apartment, you’ll enter to find modern style, ample natural light shining in from the oversized windows and private patio or balcony. Each kitchen takes a contemporary approach to styling with a distinguished package of stainless steel appliances, European shaker cabinets and granite slab countertops. Whether you choose the one or two bedroom model, you will have a guest bathroom ranging from a chic powder room to a full bathroom. At Paragon Columbia at Overlook, you can also put a little fun into your day and head outside to enjoy the amenity package. On site, you have access to a high-tech clubroom with a fireplace and billiards table, a resident greenhouse that allows year-round gardening and a resort-style saltwater swimming pool. Residents who like to stay in shape will appreciate the convenience of the on-site fitness center as well. Elkridge is a charming city with farm fresh supermarkets and family-owned restaurants just minutes away from the apartment. Schedule your tour today at Paragon at Columbia Overlook.